Fall is in the air! And my wellness-cabinet is ready! Seriously, with these and September’s ER freebies, I just keep checking off the boxes for my winter-prep wishlist!! This month there is a 400PV promotion!! That means anywhere from $40-$100 back in rewards points, and over $350 in products for FREE…just for taking care of your family’s wellness. You'll get: Oregano/Cinnamon/AromaEase/$19 or $38 back (plus be entered to win)... JUST for prioritizing your toxin-free wellness! Wins all around! Higher tiers of promos will give you more oils, more $$ back, and more entries. Let me know once your order is processed and I’ll enter you in the drawing. Drawing will be on Nov. 1. EVERYONE needs this oil going into the winter months. It’s EXCEEDINGLY high in phenols, which are potent and fierce when it comes to protection against invaders! I was interviewed on the Revolution Oils podcast about this immune supporting superstar! Click here for a blog post all about what to do with Oregano! It’s AMAZING for immune support. It’s a primary ingredient in ImmuPower, Inner Defense, and the Raindrop Technique. Cinnamon Bark: This is an ABSOLUTE favorite of mine this time of year! Totally essential for delicious dessert-inspired diffuser blends, and perfectly fall-flavored drinks and baked goods. Read all about how to use it in my Cinnamon Bark post here! AromaEase: AromaEase has a refreshing, calming minty aroma that makes it emotionally soothing. But here’s the thing about this oil - it’s like DiGize’s calmer, more delicious cousin. It’s a blend of Peppermint, Spearmint, Ginger, Fennel, and Cardamom oils. Deliciously comforting support for your digestive system! I love rubbing it on my midsection after an uncomfortable meal, or putting a drop in a cup of almond milk and a tiny bit of honey for a dessert-like, digestion-supporting treat. 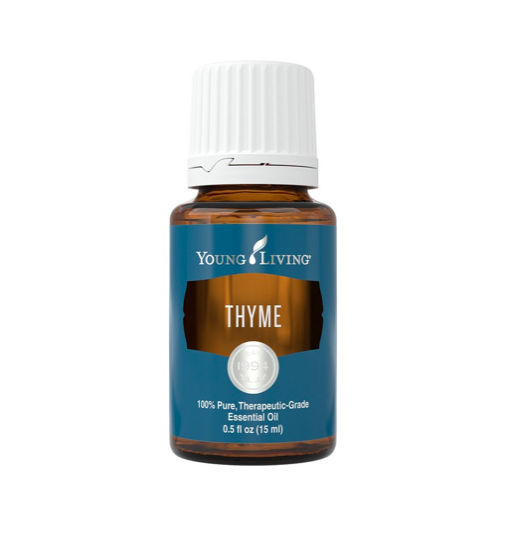 Thyme is related to some potent herbs like Oregano, Hyssop, and Mountain Savory. Young Living produces essential oils from each of these plants, and I keep all these on hand in the winter! Every time I look into the uses of these oils, I find another miracle-power that blows my mind. Check oil-testimonials.com or your reference guide app to see what I mean. Palo Santo: Distilled from the bark of a South American tree, the name means “Holy Wood” in Spanish. Its effects on the mind and emotions are profound for spiritual grounding, emotional stability, and mental calm. Think Frankincense but from a different continent! It is also used for cellular health, and nervous system and brain support. MultiGreens: a chlorophyll+greens supplement that was created to boost vitality by working with glandular, nervous, and circulatory systems. This one is VERY important for liver health! THAT MEANS…just because you’re taking a supplement with awesome greens like these (spirulina, alfalfa sprouts, barley grass, bee pollen, eleuthero, Pacific Kelp) it doesn’t guarantee it’s effective or worth your $$! 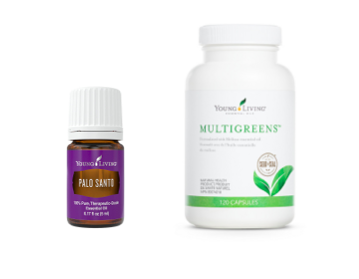 Young Living is highly intentional about the ingredients, quality and the bio-availability of their supplements. Those oils are in there for good reason! These capsules also contain bee pollen. Super helpful for seasonal sensitivities, bee pollen is loaded with tons of minerals and B vitamins. It also stimulates lymphocyte function, which in turn strengthens the immune system. Pacific kelp supports thyroid function and helps to keep our hormones balanced and in check! Very important! These classics, Lavender, Tea Tree, and Peppermint come in a unique 10ml bottle in this beautiful set. Celebrate the Young Living Legacy with some of the original essential oils offered by the company, and learn more about the unparalleled Seed to Seal process in the beautifully designed insert. The meticulous sourcing, groundbreaking science, and powerful standards behind the crafting of these essential oils create the Young Living difference.